I’m so tired of this app crashing every time I use it. The prices have gone up for cards and every time I buy one I have to scroll back down to it. How stupid. Get it together or I’m deleting your app! I love this game but I’m missing out on getting cards because the game keeps crashing! 3 times within 2 mins. Every time I try to purchase cards, it crashes!!! FIX THIS PLEASE?! Can not be used on an iPod touch. Crashes on opening screen. Can not look at cards nor participate in any game features. So I have made several reviews since joining but feel I need to lay it out there after recent moves by app owner to fix their mess up by punishing the users. The app has never really been the same since the update that made an additional currency available and they introduced the prize wheel. 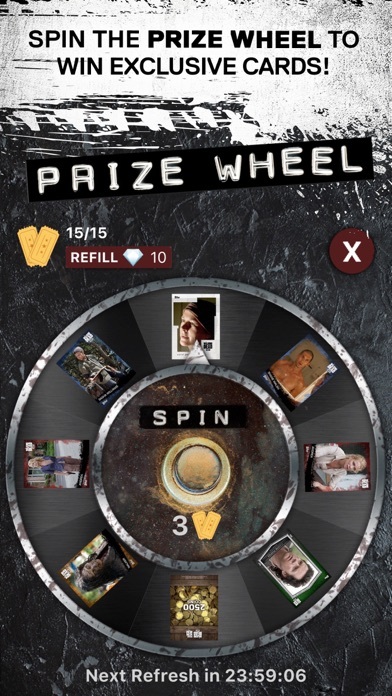 The wheel required diamonds to get the premium wheel which included currency cards on it that rewarded users with the amount on the card. Sounds good right well all good till the wheel was found to have a glitch and their answer was to take our winnings with no notice like we never won. It would be like winning on a slot machine that the casino found to have an issue with its settings. 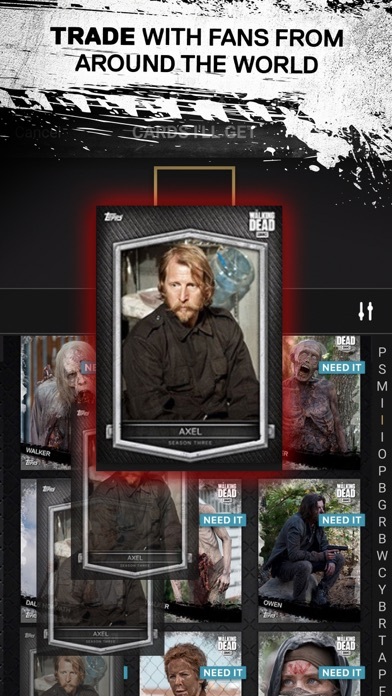 It wouldn’t happen in the case of the casino but does in the eyes of topps and the owner of the app. 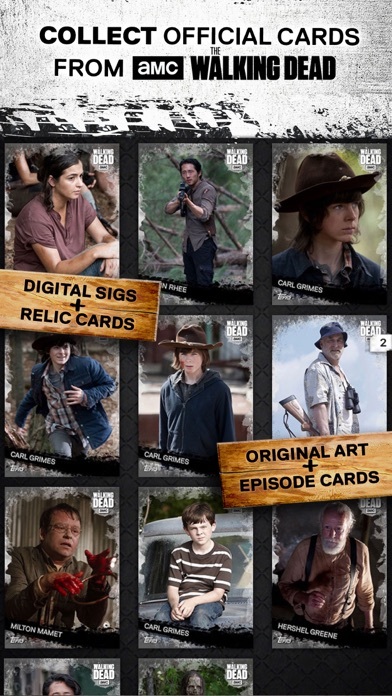 If you truly like the walking dead and enjoy it stick to real cards. If you want to waste away real money for cards that are not really yours then download the app. They have pretty much sucked all the fun out of the app in the name of a greedy company who doesn’t care about its users at all. It wasn’t always this way but times have turned in their favor and not ours. If I could give it negative stars I would. Been on the app since it’s beginning too. I loved the app and have been on since the release. 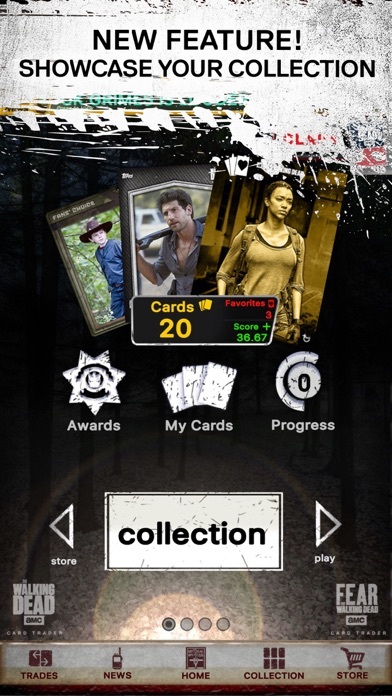 The new update has lowered collection scores, crashed app constantly, made feed start in middle, sometimes causes cards to blank out in trade and overall is frustrating. Not sure exactly what happened with prize wheel but it's now crashed and users are punished for playing it by losing wins. My issue is not that evidently there was ANOTHER glitch with prize wheel and to fix it they must take from us...my issue is that I played to get Forest green cards and OE that could only come off prize wheel. I have no control what it lands on but am being treated as if I did. If it was a pack glitch and I knew it existed, and chose to take advantage of it I can see me deserving of punishment but playing a wheel game as normal for cards limited to the wheel, isn't the same and basically the player loses no matter what! If they play they will lose what they win...if they don't want to lose they don't play and can't get the cards they need...however my biggest issue is communication. It'd be nice to be told things will be taken away b4 they are. Glitches galore that hurt players are kept on for MONTHS for lack of time but in insta second they have time to take things away and break to fix the wheel. Topps is usually good to fix their mistakes and if they do I'll change my review but lately I feel they don't care. Since my first review was deleted I will repost. What started as a fun game has changed to a primarily purchase only game. Most sets now have to be purchased instead of using coins that you earn. As posted in their own news feed, in the last few months card counts have fluctuated and trader scores have dropped and not been corrected. 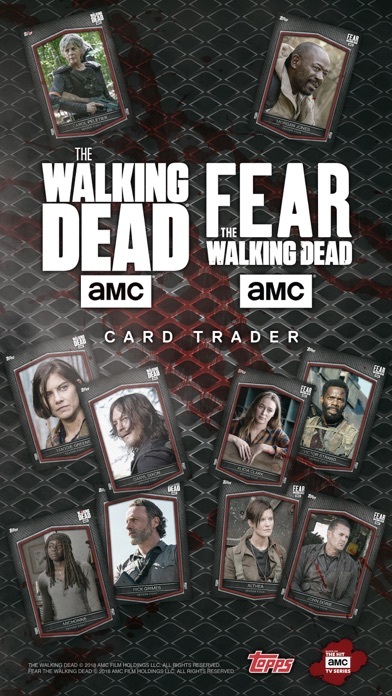 There are not enough traders left to complete basic sets. Starting the first of this year they have eliminated the coin bonus for completing sets. When I contacted customer service my question the response did not match my question which was not answered. Haven’t had access to the store to buy cards in months. Go through the “support” process and get nothing resolved. I wish I could give 0 stars.